« Cooler Weather? Cool Open Studio! It has been an interesting fall season. 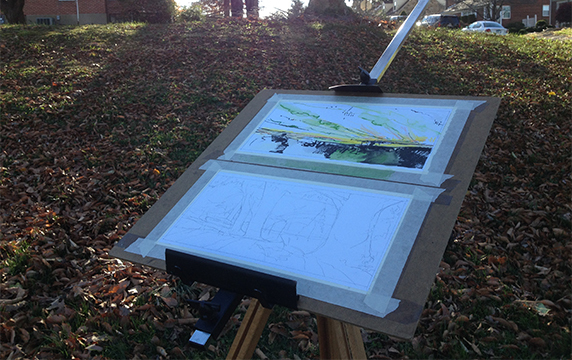 Out making sketches, working with students, and curating a water media show. I am not sure that I have had the greatest success balancing all of this. I do think that I have learned some things though … mostly when I was out working on my sketches! My work has been sporadic this fall; maybe it has been too chopped up by my schedule. More likely it has been one of those periods in the life of a studio artist when a lack of really disciplined focus slips in and nests for a while. I am not sure what is distracting me. True, I got to spend more time than I wanted in the dermatologist’s clinic than is normal (a heads up to all my fellow plein-air folk) … but I think I was off my game a bit earlier in the year. Oh well, kvetching isn’t productive either. Anyway. Here is a sketch that I made fairly recently. At this early stage it seemed to be going along just fine. I really liked the large space that the foreground tree on the right took up compared with the “row’ of trees trunks receding on the left. I felt felt like it maybe needed just a few more details and I would be ready to move forward with color. So I continued drawing. But even before I finished the pencil work, I was telling myself it was getting too fussy, too detailed … and that it was really an extremely old fashioned design. I figured it would be ok as long as I kept the painting to a minimum … staying as loose and visually frugal as possible for most of the piece; picking out just a few bold details with the color. Well that was my PLAN. I somehow forgot that strategy as I worked on and on through the stages of the image! Instead, I over did everything; spending to much time on details instead of the larger, overarching design of the sketch. It has no bold, abstracted simplification! So what do you do with a composition that is overladen with dull and fussy details and little else to say for it? It is just a sketch after all … maybe it can just end up in the pile of discards without much worry. (Ok, you caught me there, I am already sure that the preserved preliminary pencil sketches will find a use in the planning stages of a larger panel painting or two … but more about that process another day.) For now though, I wanted to try and salvage the little guy, that plain air sketch! 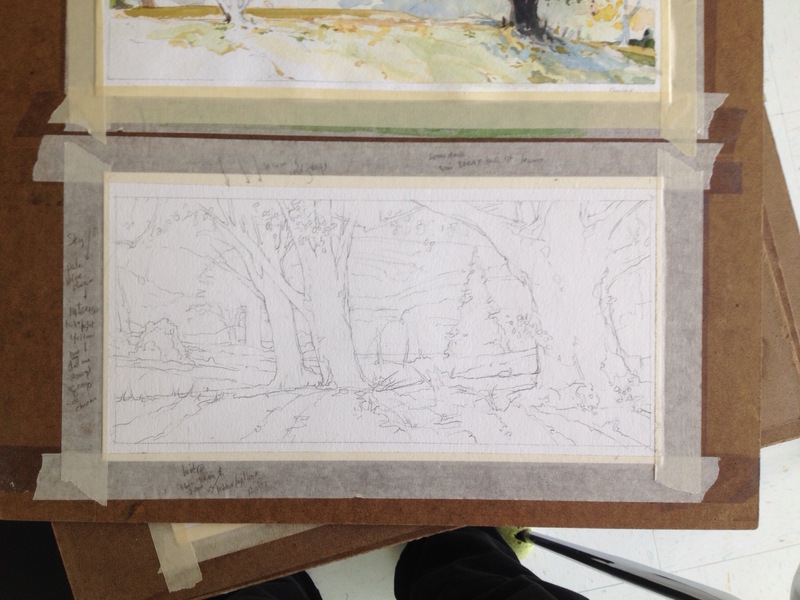 Rather than tossing it, I have employed the traditional “Third Process” for watercolor painting. (It was regularly taught back in the 18th and 19th centuries, especially in England’s Royal Art Academy.) In this method, the painting is taken back into the studio and immersed in a bath of clear water and selectively rubbed, gently or aggressively, with a soft brush. The historic use of this technique was to unify the dry and overly separate layers of paint, thus creating a more cohesive image. So, I am hoping to salvage the sketch in much the same way. I did recently bring a more successful quick field sketch back in to the studio. I had been working along the same stretch of road and still looking slightly up-hill into the fading light of the day. With this one, I stayed much closer to the idea of working quickly, more boldly. When it was completed, I had been able to preserve some of the simplicity of my first response and achieve a delicacy of color harmonies too. So, I’ve learned something working out there this fall season. 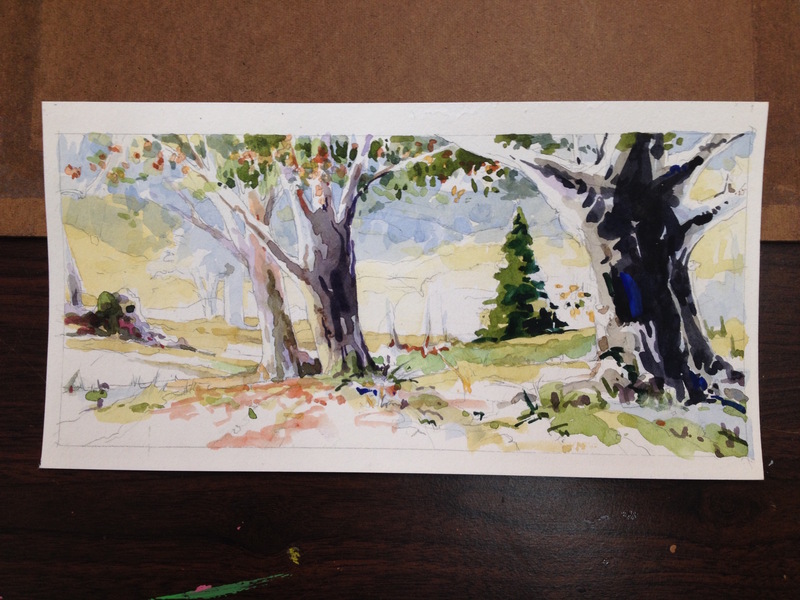 It is not something “new”; instead I have been a bit humbled … and relearned what I have known most of my painting life. 1) Stay focused and intentional. 2) Remain willing to ruin something to make it better. 3) Be open to unexpected visual excitement. 4) Find a way to keep it simple. Those are always good lessons! This entry was posted on December 13, 2015 at 11:03 am and is filed under Uncategorized. You can follow any responses to this entry through the RSS 2.0 feed. You can leave a response, or trackback from your own site. Love seeing your work, John! You all have a great Season. Thanks, I hope your Christmas and New Years is beautiful. I need to come see your studio and start/finish writing about it! Would love to give you the Grand Tour, John! January?? How interesting, John! I especially like the idea of being willing to ruin something to make it better. My painting tutor tells me the most dangerous stage of a painting is when you begin to really like it, as you can become protective of it and less open to painting freely, in case you ‘ruin’ it. So you get tighter and less responsive. He tells me to sometimes ‘ruin’ it on purpose! To see what happens. Well, I hope your bathing the painting turns up good results – or new ones. Thank you for the inspiration! Trudi, So true. Thanks. I hope you have a wonderful holiday season!